Teeth created from stem cells have been successfully transplanted back into the mouth of mice; this research may enable dentists to grow teeth from your own stem cells to replace teeth lost from injury or decay. In order to create these teeth, Takashi Tsuji from Tokyo University of Science and his team removed two different stem cells from the molar teeth of mice. They took these stem cells to grow in the laboratory. In order to control how the teeth grew, as far as shape and length, the stem cells were placed in a mold to grow. 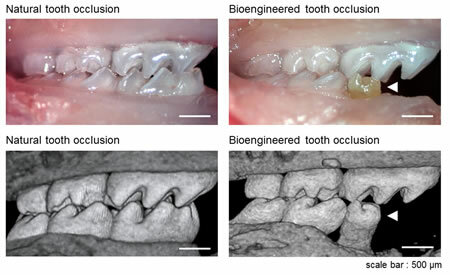 Once the cells grew into full tooth units, the researchers then transplanted them into the jaws of one-month-old mice. These transplanted teeth fused with the jaw bones and tissues on an average of about 40 days. The researchers were also able to detect nerve fibers growing in the new teeth. The mice that received the transplanted teeth were able to eat and chew normally without any complications. The one who showed up at the loft door with a box of diskettes from the Finn was a soft-voiced boy called Angelo. His face was a simple graft grown on collagen and shark-cartilage polysaccharides, smooth and hideous. It was one of the nastiest pieces of elective surgery Case had ever seen. When Angelo smiled, revealing the razor-sharp canines of some large animal, Case was actually relieved. Toothbud transplants.